When you're looking for a child photographer in Athens GA and you're wanting something unique for your little girl, book a Fairyography photo session. Dress-up pictures are not only an amazing keepsake, but they're a fun experience for your daughter! We'll laugh and twirl though her portraits, climb over rocks and tree stumps, and end up with gorgeous memories for your walls and tables. See the Product page for more! This little girl is actually a professional model in Athens GA! I hate the heat, but I do love photographing in the summer here because it makes for such golden photos. The light is perfect for pictures, and the greens of the leaves and grasses are lush and warm. This image reminds me of a headshot, with the backlight streaming through as she's posing against this arbor of cardinal flowers at Ashford Manor Bed and Breakfast. 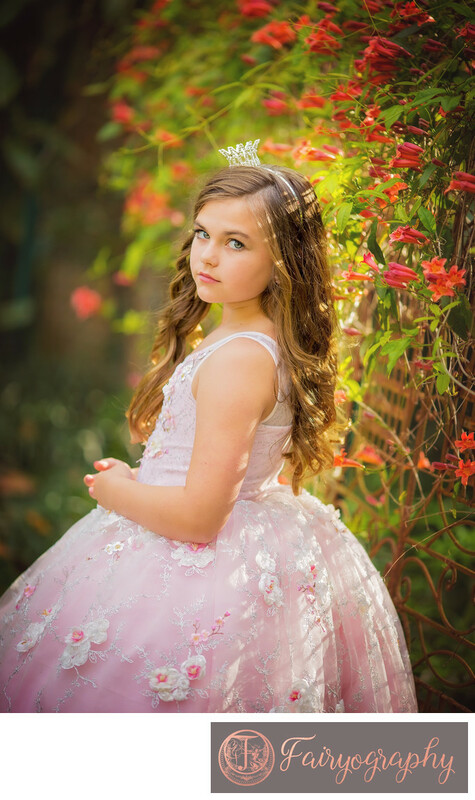 The tiny silver crown atop her blonde hair and pink Ella Dynae princess ballgown are the perfect accents to this portrait. Summer photo sessions in Georgia are hot hot hot in the evenings, so a morning start time is essential for un-sweaty ladies. No one wants drippy fairies or princesses. Short tutu style dresses help with the heat, but the humidity just kills any salon hairstyle no matter what. 8am is fairy start time for summer photos and we look to be finished by 9:30am. Location: Ashford Manor Bed and Breakfast 5 Harden Hill Rd, Watkinsville, GA 30677. 1/640; f/2.0; ISO 320; 135.0 mm.